Here’s the story behind this shot. I was visiting >>Martina’s blog<< and had commented about how I hadn’t really taken many food shots (nor has she). The short end of it was that we commented that we should both start with the same subject and compare notes (a lemon being the subject). I started out in the dining room with natural light but didn’t like how things were turning out (I need to get some “food” props) so I ended up in my “studio” (hahaha, the garage) using three continuous lights (through umbrellas). One camera left (somewhat higher than the lemon pointing down), another camera right (same positioning as left) and finally a third which I held in rather odd positions to try to shed some light at the same level as the lemon to highlight the slice from “behind”. Wowza I hope that made sense…oh well, enjoy! This looks delicious! great work! love the colors! Great shot David! I was never able to get my lemons quite as yellow as you did, very nice! Thank you Jim, there’s always lemons out there to shoot and make interesting! And no lemon juice squirting in your eye, what a bonus! Thank you for the comment Mike. Oooo! I like this shot! You really brought out the lemon in the lemon. Love this shot! Nice composition. Thank you, I really like TGV’s comment about having the centre of the lemon right in the lower left corner, perhaps next time eh! This shot makes the lemon look good enough to eat! As in… not so sour. I’m not sure if I’m making sense. What I meant to say is GREAT shot! Nice macro David. Very nice lighting. It brings out some interesting texture. Love this simplistic subject/composition. Nice lighting and colors have turned out real good. I like the lighting for this shot. I think a black something under the lemon would bring it out more. What a great project! The lemon looks almost fake! Im looking forward to seeing your ideas! I am thinking if I got one of those bendy LED lights so I can really get the backlighting to sing…hhmmmm…. Very Nicely done David. 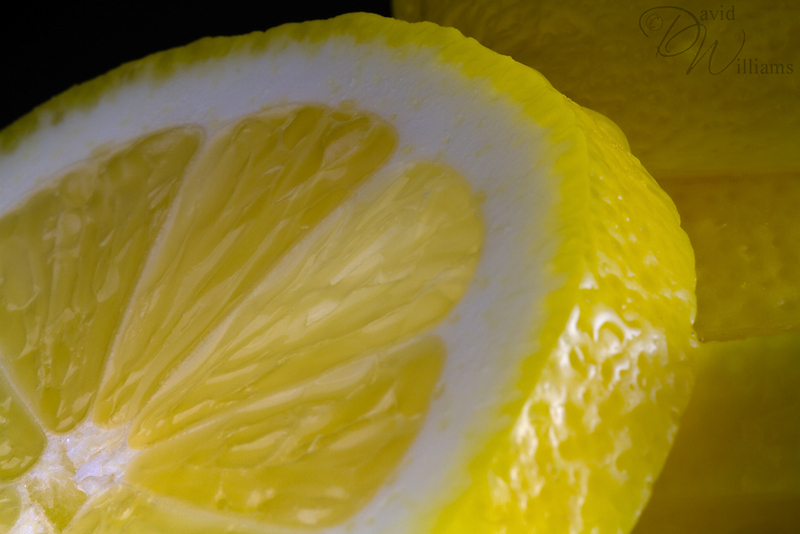 I did take some shots today of that lemon I had in my fridge. I kept thinking I have to retake when I have better light and slice it. You did an excellent job with your food shot. Haven’t downloaded it yet, but I just might do that now. I love your creative touch and wonderful texture and great colour. You are on your way to foodie photos….